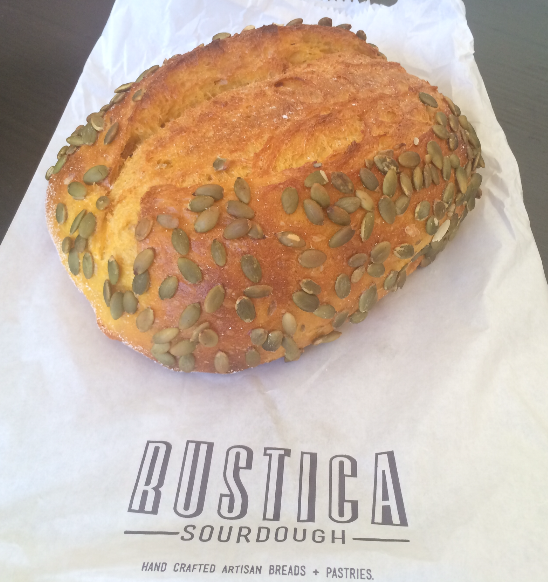 Rustica sourdough make beautiful artisan breads and pastries on site that look spectacular and taste amazing. Lots of care has been taken to create these beautifully hand-crafted delights and you can taste the love. 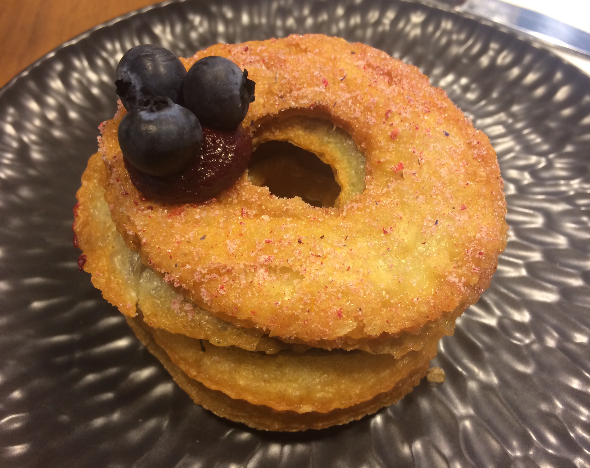 Their menu highlights their traditional breads in a unique and modern way. As I walked in I was already drooling over the breads behind the counter and pastries on display, they looked amazing. There were shelves of different breads, which are all made on the premises so they are as fresh as can be. Sourdough, seedy wholewheat and rye, oh my. 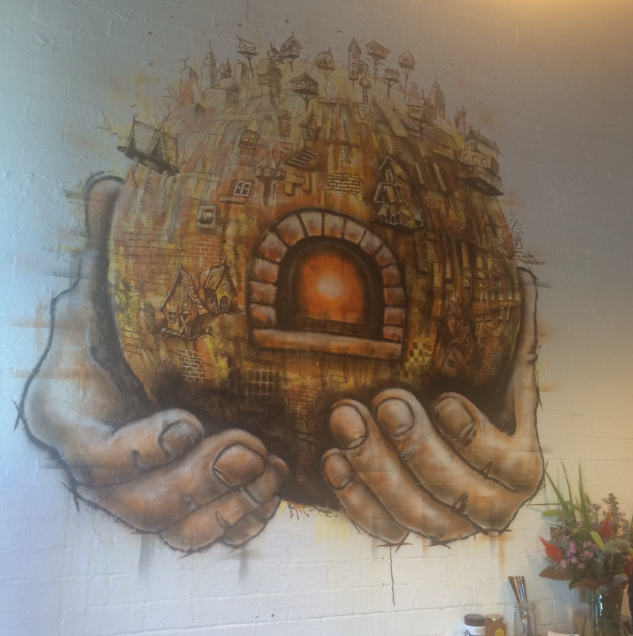 They had some cool art on the walls. 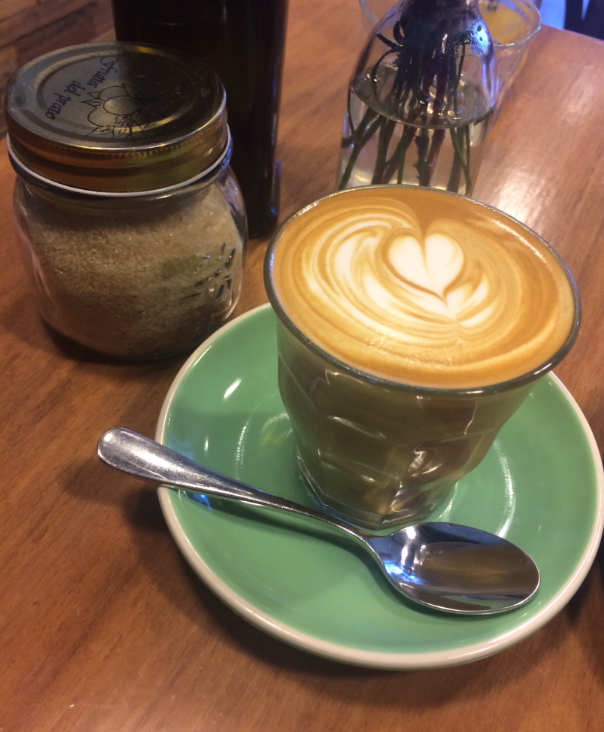 They do a good coffee. The Rustica breakfast board has a little bit of everything. 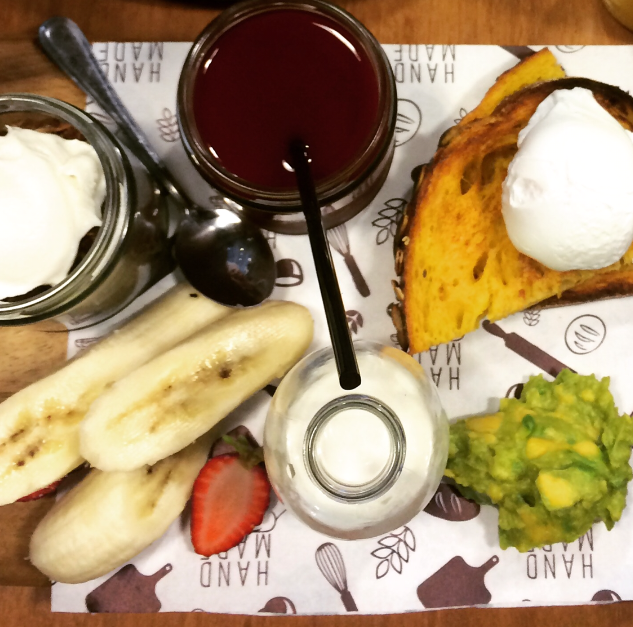 You get a jar of house made granola w organic yoghurt. The granola was nice and crunchy with toasted oats and seeds and yumness topped with the organic yoghurt, which was thick and creamy. And a bottle of milk to go with. Then you get a glass of cold press juice, I chose apple, orange and beetroot, which was delish. Then there was a slice of pumpkin sourdough (OMG amazing!). It was a rustic, hearty slice of sourdough with a delicate pumpkin flavour yum. It had a poached egg on top with oozing yolk and a dollop of zesty smashed avo beside it. Everything you need to start the day. It was a really well rounded meal and a super cute idea. All the elements on the board were tasty. The French toast was impressive. 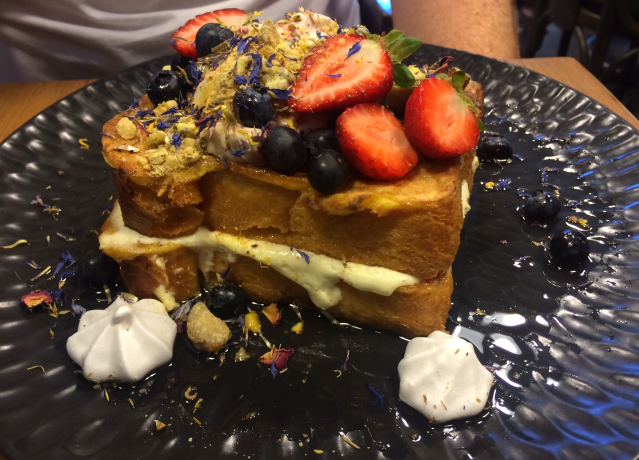 There was sweet ricotta and soft roasted figs sandwiched between two mega pieces of buttery brioche French toast. It was so soft, it was like cutting through butter. It was light and spongy and delicious. It was dressed with lemon myrtle syrup and topped with raspberry mascarpone, nuts, fresh berries and little flower petals. Very pretty. I had to take home a loaf of pumpkin bread. It was fluffy and comforting, a tiny bit sweet and oh so fresh. It was the kind of pumpkin bread you only eat in dreams. Perfection! Easter bunny alert! False alarm it’s just Max. Those bunny ears fool me every time. 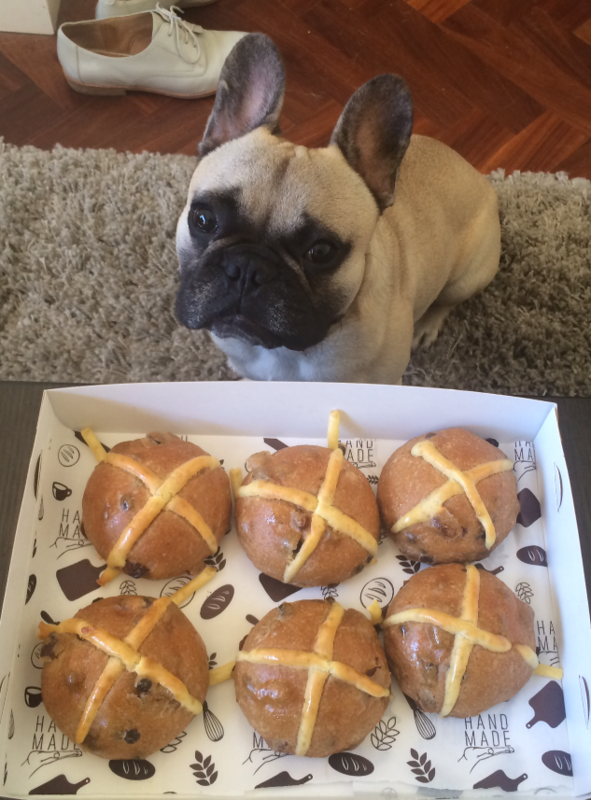 The hot cross buns he is trying to get his paws on are baked fresh at rustica and are absolutely delicious. They have lots of fruit and a really nice flavour. I also whacked on a large helping of butter, which made it even butter, I mean better. I assume these buns are only around during the easter period so best to visit soon if you’re into buns of the hot cross variety. 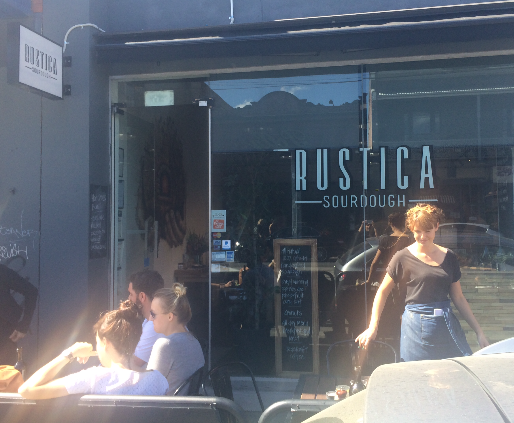 I really enjoyed my experience at Rustica Sourdough. How can you beat traditional artisan hand crafted bread baked fresh? 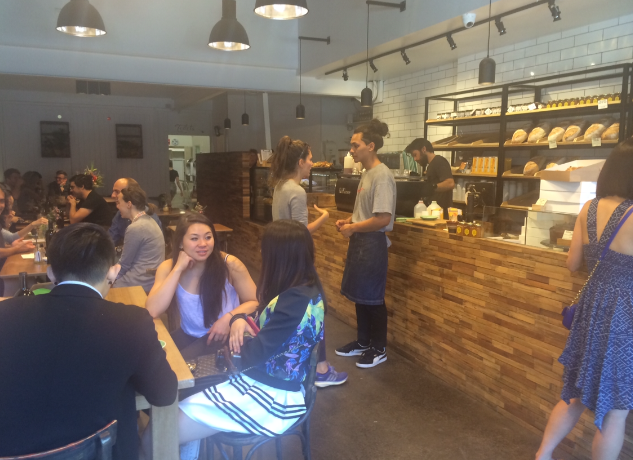 The staff is friendly, the food is delicious and the bread is top class. I just wish I lived closer so this could be my local bakery. 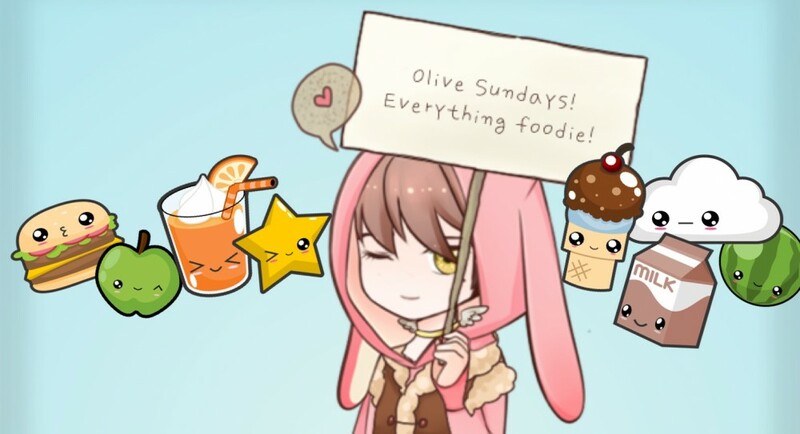 Note: Olive Sundays was invited as a guest to Rustica Sourdough Bakery.